Clockwise, from left: Russian cosmonaut Sergey Ryazansky, ESA astronaut Paolo Nespoli, NASA astronaut Joe Acaba, NASA astronaut Mark Vande Hei, Russian cosmonaut Alexander Misurkin and NASA astronaut (and space station commander) Randy Bresnik pose for Halloween 2017 aboard the International Space Station. 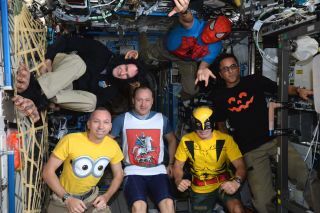 Some years an astronaut or two may dress up for Halloween, but this time all six crewmembers on the International Space Station got their moments in the spooky spotlight. "Now that I can literally walk on the 'ceiling,' I can finally be what I was meant to be," he commented when posting a photo of the whole crew. Besides dressing up, the space station crew has been busy harvesting lettuce, cabbage and mizuna from the Veg-03 experiment, according to NASA's space station blog, as well as setting up EarthKAM for students to remotely photograph Earth. Last week, they took a call from Pope Francis. And on Oct. 16, the crew got suppliesfrom a Russian Progress spacecraft; perhaps some of these costumes, or at least some Halloween treats, were on board.